Did I mention last week that this latest piece I am working on is SLOW going? It’s a complementary warp pick-up technique, not one of those friendlier partly-loom controlled ones, and I have almost 600 ends in the pattern section. So, if I show you a picture of where I am at this week you can be excused for thinking that I have done nothing, or at least very little! I had, in fact, progressed further but I un-wove a fair bit after discovering that the next pattern I had chosen wasn’t coming out anywhere near as big and bold as I had envisioned. I will need to re-chart it at twice its size. It is heartbreaking un-weaving after having picked all those threads but it is bound to be worth it in the end. 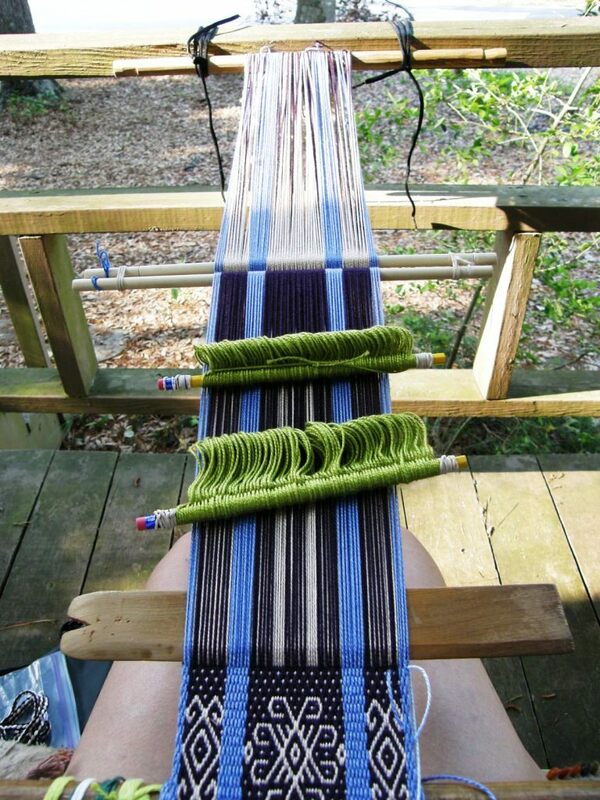 And as if the pick-up isn’t slow enough, I have decided to add some weft twining. What is slower than picking and dropping?…twisting and enclosing. So far I have only added that one thin strip of twining which is one of the elements which will link all the hangings I am making in this series. I am thinking of adding yet another broad strip of patterned twining that will go from edge to edge. I shall think carefully about this as undoing twining is probably the worst kind of ripping out there is! The Wayuu twine along the bottom of their si’ira belts but I am undecided about whether to use their technique or the one with which I am more familiar. In the meantime my cat is determined to get as much of her hair as possible over the other two almost finished pieces. This all had me thinking about this process of picking, dropping, twisting and enclosing to make patterns and why I love it so much. It occurred to me as I was writing the first few paragraphs here that I was making the process sound somewhat painful and frustrating when in actual fact it is both relaxing and stimulating. I have been emphasizing the slowness of it all which may give some an impression of tedium…quite the opposite in fact. What has made the work on this piece slower than it should be is the lack of planning on my part…it’s all my fault…thus the weaving and un-weaving and yes, that part can definitely be described as frustrating and tedious. 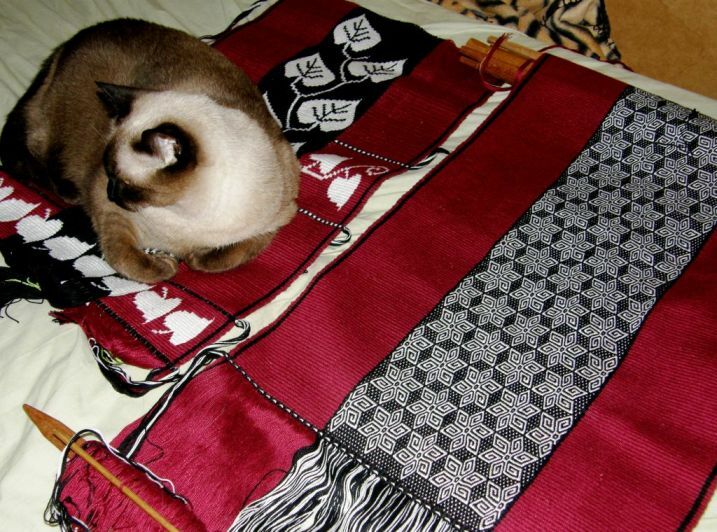 Take a look at this video of weavers in Bhutan (link provided by Toby from the Ravelry group) doing weft inlay patterning. Their tiny picking movements are graceful and delicate and rather than think “oh my gosh, how painfully slow and tedious that must be!” I think “how incredibly beautiful, skillful and relaxing. I want to do that too!” I wonder if I look quite so calm and peaceful as I work! I do find that I need to stand up from this piece more frequently and take a walk around. I definitely don’t progress the four fingers width that weavers here in Bolivia have told me is the measure of a good day’s work. Sometimes I spend an entire day charting what I think will be the next part of the design only to abandon it! Lets see how far I get with it this coming week. 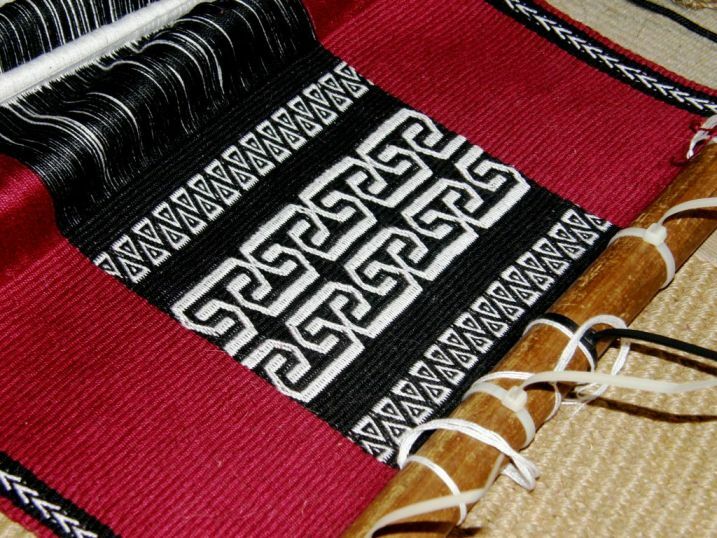 Fortunately not all the patterning techniques involve picking and dropping every single warp thread across the width of the loom. Many techniques can use pre-programmed patterning sheds and be partly loom-controlled. 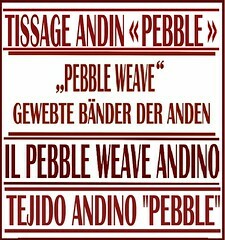 Pebble weave is one such technique in which many of the designs can be woven with the aid of two sets of string heddles meaning that you only need to do pick-up in every other shed….pick-up warps by hand in one shed and then enjoy a free ride in the next by simply raising a string heddle and passing the weft. 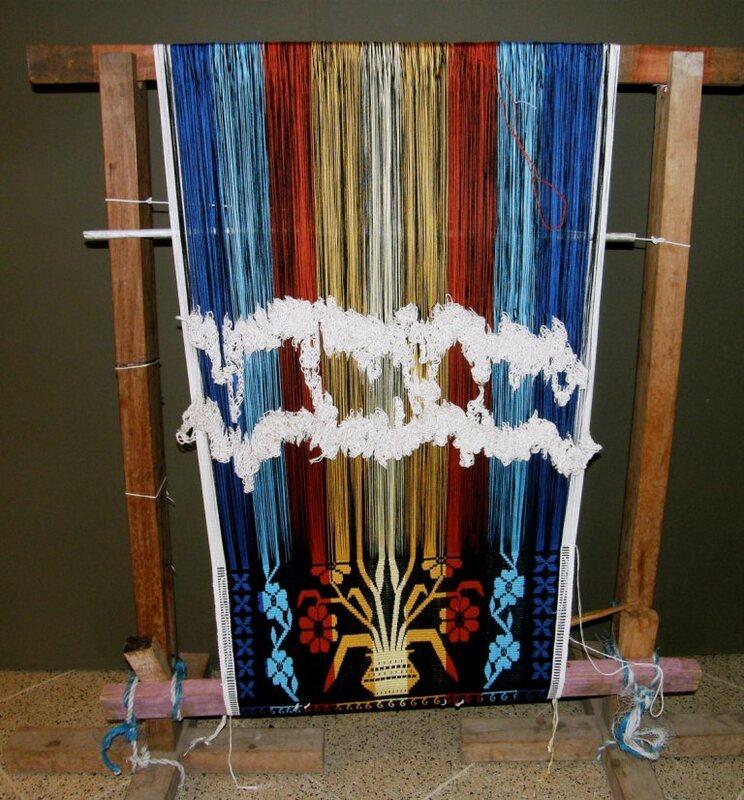 The Moisy technique which my Guarani weaving teacher Angela uses is another one that rewards the hard work of a row of pick-up with a “free ride”, that is, a weft pass every other row through a heddle controlled shed. And then there are those techniques which I have nick named “drop-down” rather than “pick-up” methods. Warp substitution is one of them. The weaver simply drops a warp thread out of the open shed in order to create the pattern rather than having to select and pick one up. 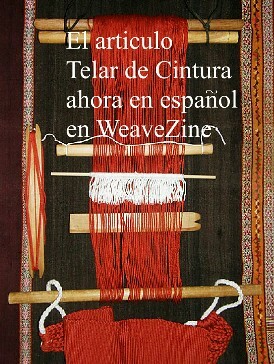 Basic supplementary weft inlay is also a technique that I would nick name “drop down”. 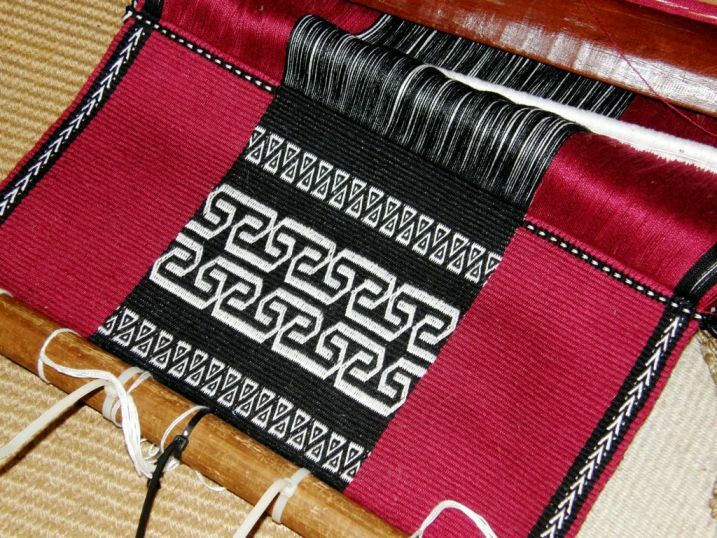 The weaver drops certain warps out of a shed which creates gaps through which the colored inlaid weft can be exposed to form a pattern. The simple warp float technique, in the way I was taught to do it, also falls into my invented “drop down” category. Warps are dropped out of the open shed. Those that are kept will float to form the design. These are all nice ways to get used to counting and handling the warps, dropping, selecting, saving and picking them to form the patterns. Some people may find that one of my so-called “drop down” techniques is the one with which they feel most comfortable. 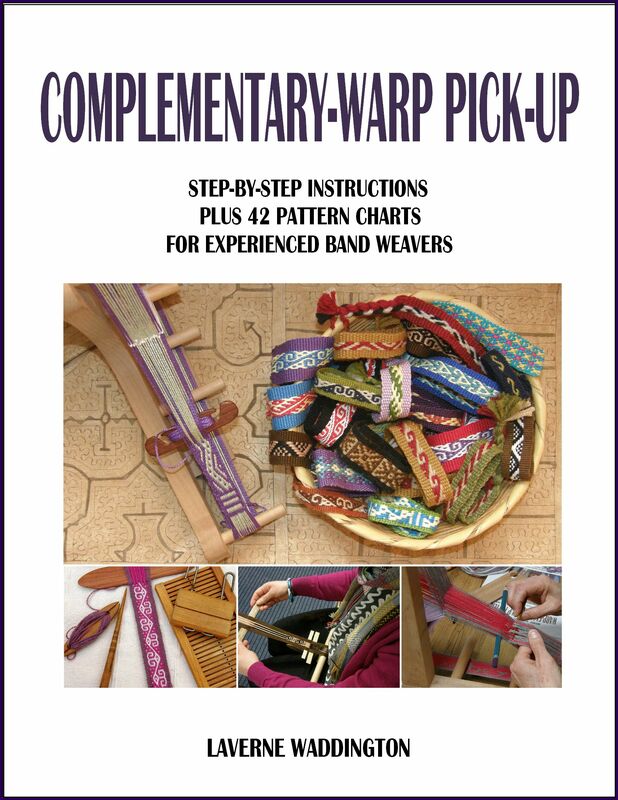 Others may find that they like the added challenge of selecting, picking and dropping the warps while also being able to enjoy that loom controlled “free ride”. Yet others will become so enamored with the pick-up process and the patterns it enables them to create that they will be more than happy to sit for hours and be proud of their four fingers width progress each day. Check my tutorials page for links to the various instruction pages. Last week’s mindless fun for my breaks from the loom was juggling. 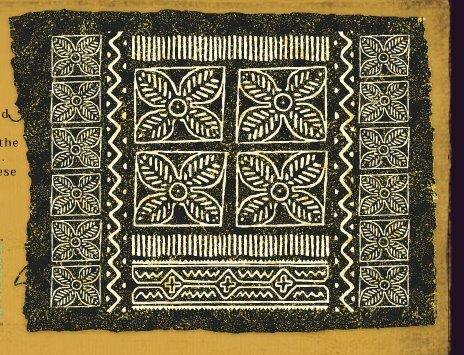 This week I played around online on a site which allows you to create your own mudcloth design. 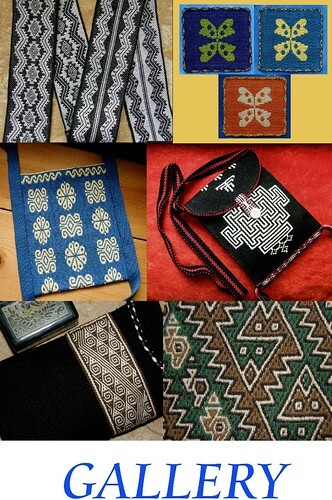 This link was provided by someone in one of the Yahoo groups and apart from a few minutes of fun, it also gave me some nice bold designs which, who knows, could form part of a future weaving. And, thinking back to last week’s post and the crochet work and juggling balls, I see that Education and More are offering some unique crocheted Guatemalan juggling balls on their site. The crocheted designs on the Wayuu susu bags I showed last week are still enticing. If you are contemplating getting out your hook and trying to make something similar here is Carol Ventura’s (author of Tapestry Crochet) video on a technique that can be used to create such designs. 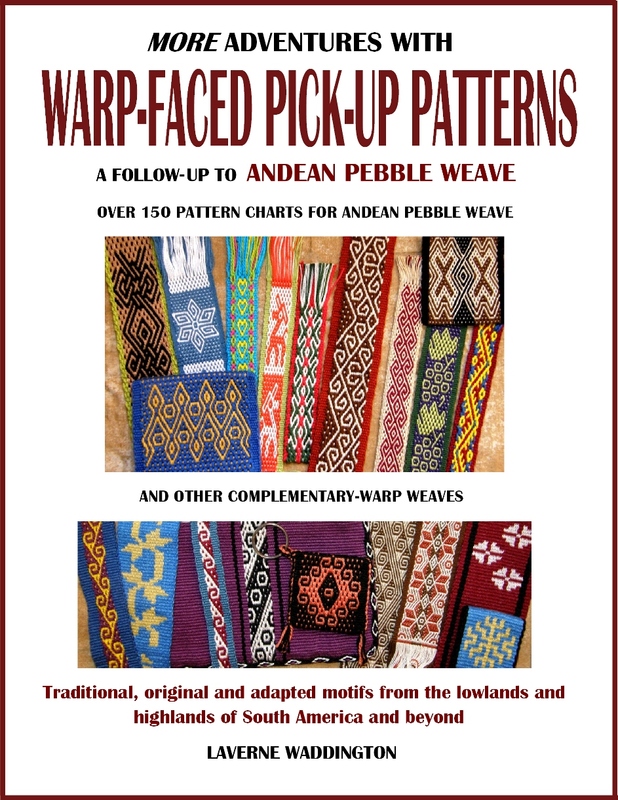 I can’t say for sure if this is in fact the technique used by the Wayuu to make their bags but you could certainly use their designs and colors as inspiration for something in tapestry crochet. So, what will you be into this coming week…hooking, picking, dropping, twisting, juggling, or clicking the mouse and gathering resources? 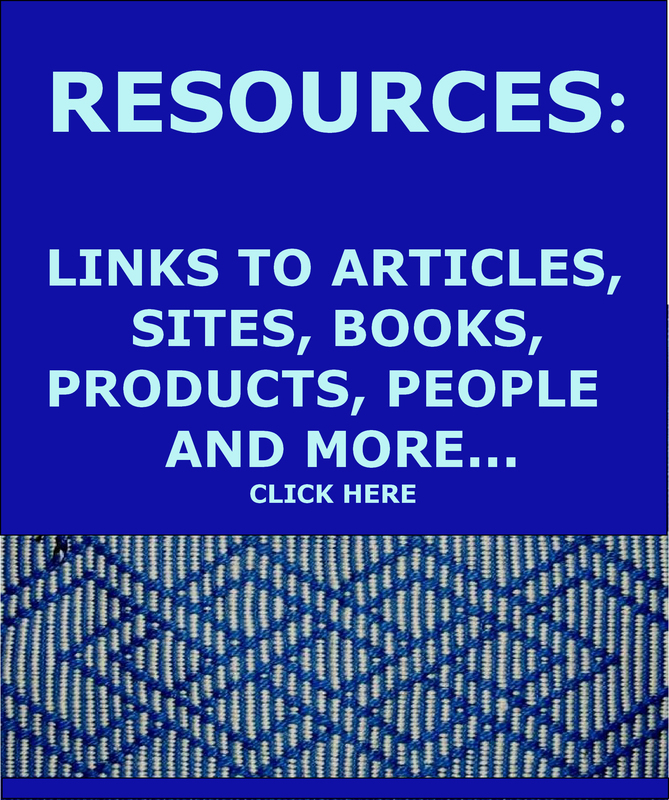 « Backstrap Weaving – Juggling! You are such an inspiration. I’ve been following you for months now and eagerly await each installment. I hope to join the ravelry group one day and start my own project. Thanks for helping keep this art alive!! Love your posts. I look forward to them each week. It was good to see the video on tapestry crochet. Thank you for all the work you do.